Today’s episode is all about discovering the impact of brand on your organization’s bottom line. While many companies want to focus their investment on Do-state marketing, it’s actually less expensive to invest in brand and build affinity earlier in the customer journey. Ex: A company’s margins covered their AdWords costs until Google changed its search algorithm and its deluge of traffic turned into a trickle. Ask yourself: is your brand strong enough to withstand a new competitor coming to market, or an algorithm change? Brand definition – develop a personality for your audience to fall in love with, or the emotion you want to create in your audience. We hope you want to join us on our journey. Find us on IterativeMarketing.net, the hub for the methodology and community. Email us at [email protected], follow us on twitter at @iter8ive or join The Iterative Marketing Community LinkedIn group. The Iterative Marketing Podcast is a production of Brilliant Metrics, a consultancy helping brands and agencies rid the world of marketing waste. Join IterativeMarketing.net and gain access to exclusive materials only available to members. Membership is free. 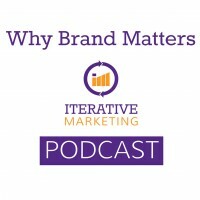 The Iterative Marketing Podcast is a weekly show dedicated to helping marketing professionals and entrepreneurs implement Iterative Marketing for your organizations and your clients. Subscribe today and be a better marketer. The podcast can also be found on YouTube, Stitcher, SoundCloud and Google Play. IterativeMarketing.net is hosted and maintained by Brilliant Metrics, Inc, a consultancy out to rid the world of marketing waste through marketing measurement, optimization and automation. Learn more about Brilliant Metrics.